November 22, 10am-noon, Coffee Hour – join us for a cup of coffee or tea, a sweet or two and good conversation. Suitable for all ages! 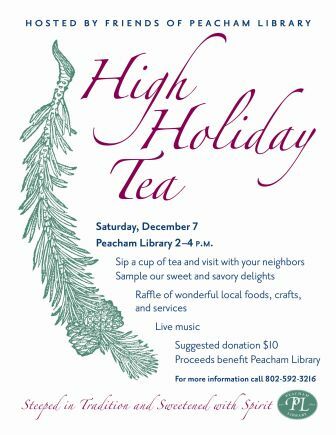 November 25, 5:15pm, Friends of Peacham Library — Planning for the High Holiday Tea. New and old members are always welcome! November 25, 6:30pm, Peacham Knitters – Bring your knitting or other handwork for an evening of creativity and chatting. New knitters are welcome to come for help and encouragement. November 28, Thanksgiving — The library will be closed. November 29, 10am-noon, Coffee Hour – join us for a cup of coffee or tea, a sweet or two and good conversation. Suitable for all ages! December 7, 2 – 4pm, High Holiday Tea — Sip a cup of tea and visit with your neighbors. Sample our sweet and savory delights. Take a chance with the raffle. All to support Friends of Peacham Library. December 14, 10am – noon, Santa, Crafts and Latkes — a party for the whole family. Start the morning with crafts, followed by a visit from the man in red, and end with a feast of latkes and applesauce. Friends of Peacham Library have new Gilmore notecards for sale! Help support the Friends and the library by buying some for yourself, your friends and your family!